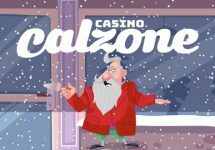 Casino Calzone – Trick or Treat? Collect Free Spins every day until Halloween! It’s that time of the year again! Suit up in your most amazing costume and grab a friend to knock on some doors. Get your hands on the most tasty candy or play them a fun trick. Simply make a modest deposit every day until Halloween to collect a scary treat based on the deposit amount. Will it be trick or treat? Players spinning on any slots at Casino Calzone during the weekend will receive a cashback bonus the following Monday. For any activity between Saturday 00:00 – 23:59 CET Sunday, they will receive up to 5% cashback in bonus money on any dough burned during this period. This will be credited by 18:00 UTC every Monday for the previous weekend’s activity. Cashback bonuses will be paid from minimum €10 up to a maximum of €1,000 per weekend. Minimum one deposit is required during period. Losses from bets with bonus money do not contribute. Cashback bonuses are credited with a 20x wagering requirement, subject to the Casino Calzone bonus terms and conditions. Not yet baking your lucky pizza at Casino Calzone? Then sign up now to enjoy their €450 Welcome Package and 150K in Cal’s Cash. Bonus terms and conditions apply. 18+ only. 28th – 31st October 2017: Casino Calzone – Trick or Treat? Cal is not just in his usual generous mood but also up for some tricks and treats. Enjoy the run-up to Halloween with him at Casino Calzone with a daily scary Free Spin treats until 31st October 2017. The size of the reward is based on the first deposit of the day. Minimum deposit is €20, but remember, the bigger deposit you do the greater is your reward. Free Spins will be instantly added on a selection of games after the deposit is completed. One reward per player per day only. Wagering requirement is 35x Free Spin winnings within seven days. Casino Calzone bonus terms and conditions apply, always read them carefully.